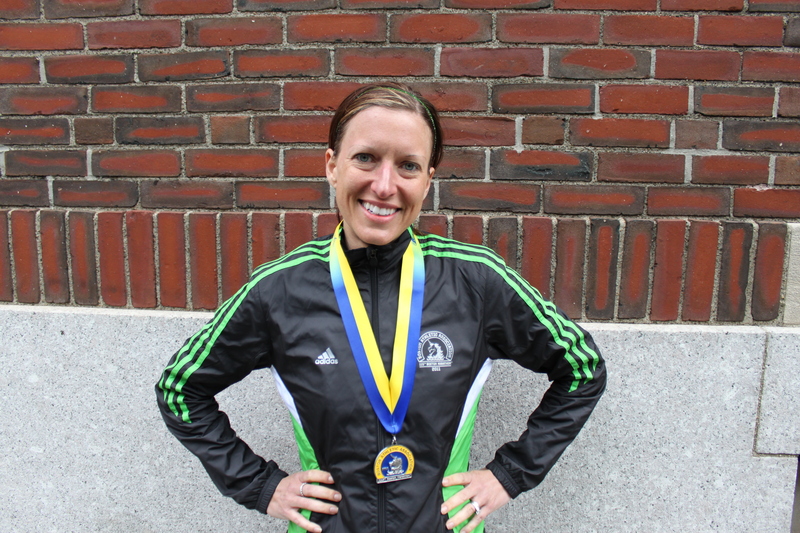 The marathon of all marathons – BOSTON!!!! I was up at 3am to eat breakfast and get ready slowly to make sure I had everything. We headed out to walk to the busses at 5am. We stopped into a Dunkin’ Doughnuts that was open on Boylston. It felt a bit silly to be up and heading to the busses so early. The wave 2 recommended time for busses was 6:30-7:00am, but they would be arriving at 6am. We were warned to get there early! 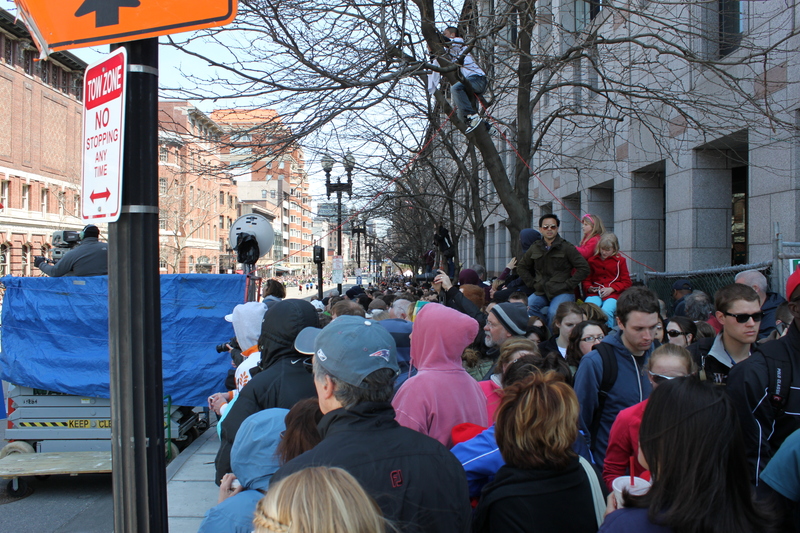 Once we got to Tremont side of Boston Common we saw that the lines were already forming so it was good that I was there early. Rob and I kissed goodbye and he headed back to the hotel to do his long run. While in line I found out that others were saying that getting in line early for the busses was the best way to go. We were on the first set and by the time they finally left the lines were insanely long. I made friends with Natalie on the bus ride. It was her first Boston too and she was more prepared than me. She had extra food, a garbage bag to sit on, and just extra everything. She was such a cool girl that we ended up chatting it up in athlete’s village the entire time and it really helped my nerves. Natalie shared her garbage bag to sit on and extra pants. Even though the weather would be great for running it wasn’t warm for sitting on the cold ground for a couple of hours. While we were hanging out I saw my neighbor Kim that was also running! She paid $30 for a chartered bus to get to Hopkinton and it sounded like a sweet deal! It was a long wait, the longest I’ve ever had for a marathon. Chicago is usually 2 hours, from 5am – 7am. This was 5am – 10:20am and I don’t think I judged how much food to eat correctly. We bag checked and walked up the to hear the Wave 1 start take off. We stripped layers off and lined up for the Wave 2. Natallie was corral 6 so we hugged and wished each other well. I hope that Natallie had a great race and enjoyed every mile! 🙂 I lined up in corral 1 and within 5 minutes we were off! It was just as everyone who has ran this race before has warned, it easy to get sucked into the first 6 miles of the downhill momentum. Not to mention we had perfect weather and a tailwind. I fought to not get sucked into faster pace. I spent a the first 6 miles checking my watch often to make sure I was taking it easy. I felt totally relaxed and just enjoyed the easy pace. I knew I had to make sure that the first half was easy so I could save my energy on what was ahead. Around mile 11 or 12 my stomach started to hurt, I knew I was going to have to make a potty stop. 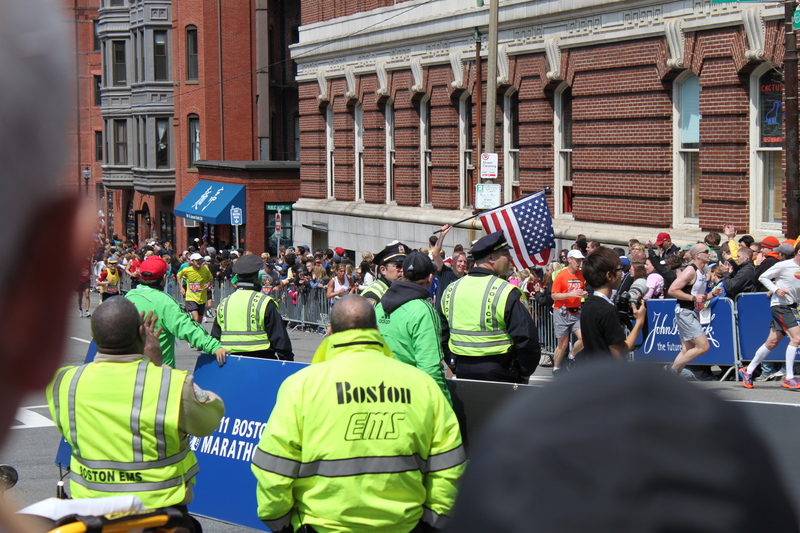 The Boston Marathon has frequent and plenty of water and gatorade on the course. Porta-potties, not so much. Each water stop had either a set of two or four only and a line of runners waiting, not good. This meant if I was going to make a stop I was going to have to go for an opportunity when there was one either open or where I would be the next person in line. Even though my stomach started hurting, I refused to let it ruin my mood. On the course the crowds are great. So many people are handing out sliced oranges, candy and popcicles. It was so warm out and I figured my stomach was rocked already, so screw it, I snagged two green popcicles from some kids handing them out. What a nice running treat! I also had a small peppermint pattie, yum! Before I knew it we were through the half and at girls of Wellsley. There signs were very cute. “Kiss me I’m a chemist”, “Kiss me I’m Canadian”, etc. I saw a few guys get some run by kisses others settled for high fives. That was another thing that I noticed about Boston. Giving 5 was very common, not just with the kids, but all ages. So if you run the edges of the course you better be ready to slap hands with a bunch of people the whole way, don’t hold out on the crowd if you are on the edges. I did a few hand slaps, but then stuck to the middle of the road mostly because the road seemed pretty crowned in areas. By mile 15 I finally found a porta-potty that I would be the next person in line. I waited and anxiously moved my legs to try and not lock up. I got in and out of there as quickly as I could. Things in general were a blur. I’m not great at noticing landmarks or buildings. I kept my eyes on the road to keep from tripping on any crack or manhole in the road. I did notice the city signs, but time did fly by quickly. At Newton the hill things still felt good. I felt okay although I knew my pace was slowing. By Heartbreak that was another story. I learned very quickly that I’m still not hill worthy. Every hill my legs began to burn more and more and my left foot felt swollen, which was a new feeling. I was feeling trashed. Luckily I ran into a fellow blogger SkinnyRunner! We chatted for awhile. She is an amazing runner and was so sweet in person. She made the comment that this was the first time she ate candy on a race course (cinnabears and licorice for her) and I said it was the same for me. She was looking strong and made the hills look like any other day for her. Meanwhile after the hills I faded. My legs felt toasted. All my muscles were burning, similar feeling of a first marathon. By mile 22 I hit the wall. I’ve never hit the wall in the marathon, not like that. I was out of gas and my muscles were screaming. The rest of the 4 miles was a mental race to move forward. I looked around and soaked in the crowds screaming and cheering, knowing this was almost over. I wanted to remember this feeling of all of the cheering. I burst into tears of joy and cried for at least a mile while running. The last miles it was so great to be back in Boston and experiencing the large crowds. I only wish that I wasn’t feeling that awful so I could race as fast as my heart wanted to. While all of this was going on Rob was race commentator to all of our friends, keeping them up to date with texts and posts on facebook. He did an amazing job! He tried to find me in the race, but we just missed each other. He was on the corner of Boylston and Dalton. 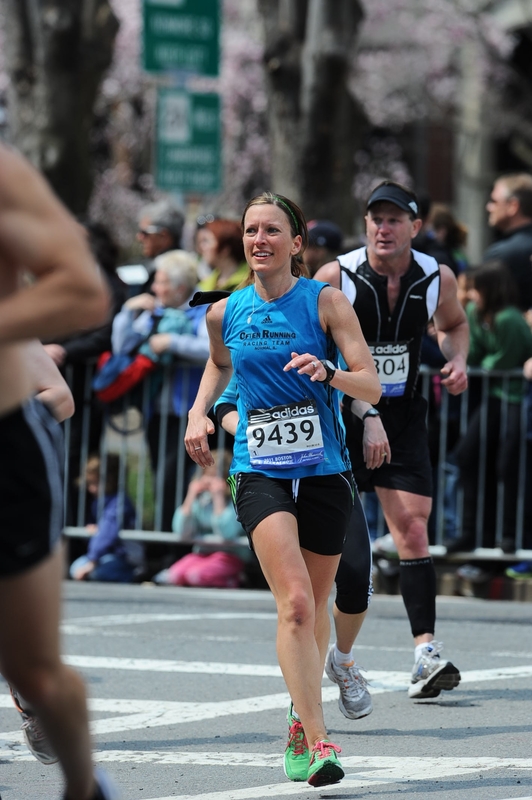 Categories: Boston, Boston Marathon, BQ, Race | Permalink. Congrats! I’ve been waiting for your recap! I love following you on your running journey! I teared up reading this. What a big accomplishment! I run my first 1/2 on May 1st and I can’t wait! Congrats on your first Boston! Im so proud of you & loved getting your split updates!!! Abby you are so sweet!!! Thank you so much for the support and decorating the house! It was an awesome surprise! I hope the concert was fun! Congrats to you!! It was truly an amazing experience!!! You, my friend, are such an inspiration! Thanks for sharing your experience! 🙂 I’m so proud of you! Thanks Amanda!!! 🙂 It means so much to have you encouraging me! I can’t wait to catch up! Thanks Wendy!! I’m glad you checked out my blog! I will check out yours as well! OH MUH GODD! YOU DID SO AWESOME GIRL! SERIOUSLY AMAZING! (Yes all caps was needed). I’m so excited for you. 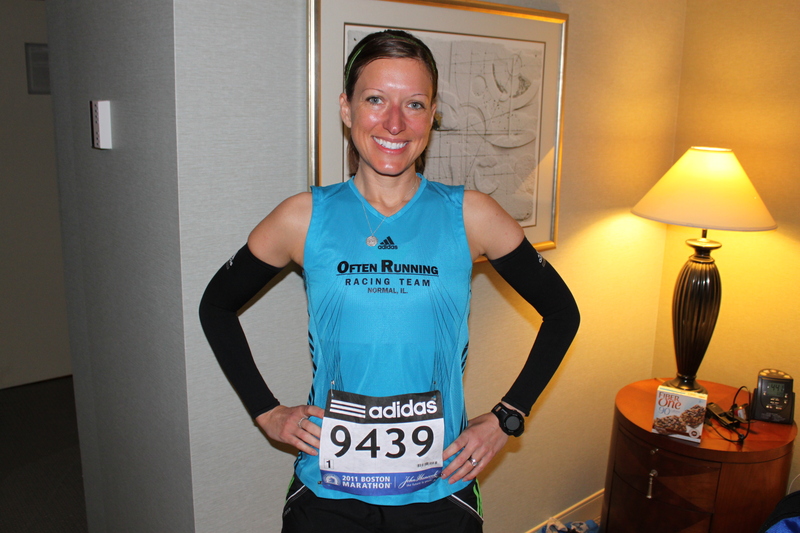 I saw you on Skinny Runners blog and I could not wait to hear how you did. I’m glad you had a good time. If you decide to do the BM is 2 years, you’ll hopefully see me there too. 🙂 We can be Boston BFFS. Um oh yes and your outfit is the bomb.com. Hey SR! Yes lets def meet up next time! Congrats to you! You are awesome! I loved your recap. You continue to inspire me to become a stronger, faster runner. I had a similar experience….tried to reign it in the first miles, but by the end of the hills, my legs were SCREAMING. Dig deep, and smile! It’s Boston. I ran a 3:40. Not my best either, but considering the crazy winter/injury/flu combo and then HILLS – I’ll take it!!! It was a gorgeous day (sunburn to prove it!) and I am so happy. And I agree with you, I definitely feel differently about the marathon now. We are part of it, and it’s huge! I feel lucky to have spent those few hours with you, I felt so calm & ready, distracted …ready to run. Eeeeeee!!!!! I’m SO glad you found me and wrote me!! I told Rob that I wished I would have just given you my email too, but I didn’t think of it at the time. I was wondering how the race went for you. I’m SO glad you had a great time!! 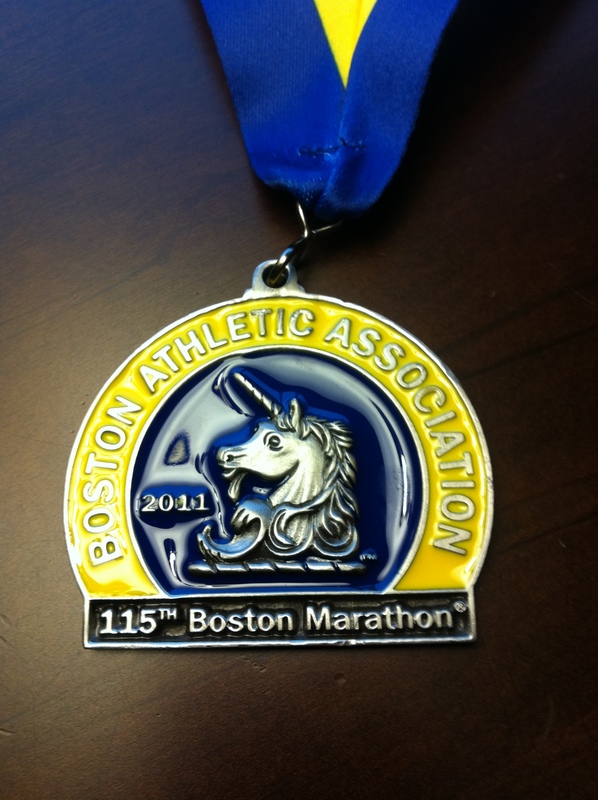 We earned our stripes and are now Boston Marathoners. I just said in yoga tonight that some how I feel older from that race in a good way, just like I found out more about myself out there. Like skydiving, the event becomes a part of who you are. 🙂 It feels so great!! I think we were meant to meet that morning. It definitely calmed my nerves and felt like I was hanging with a friend I’ve known for ages. Thanks for being so cool and sharing all of your stuff with me!!! Woohoo!!! You go girl! Seriously, you’re awesome and you should be darn proud of yourself. Amazing!!! Thanks for sharing the experience with us! Congrats on being a Boston Marathoner!!!!! Way to go! Thanks for giving us a recap, I always wondered about candy and sweets on a race. Awesome! You are such a rock star! Congratulations on your huge race.